JACKSONVILLE, Fla., April 3, 2017 /PRNewswire-USNewswire/ -- Having recently hit a huge milestone of serving more than 100,000 combat warriors – in addition to their families and caregivers – Wounded Warrior Project® (WWP) fully launched one of its highly popular pilot programs. WWP Talk is a national mental health support line that is an invaluable, non-clinical form of emotional support for warriors, family members, and caregivers. 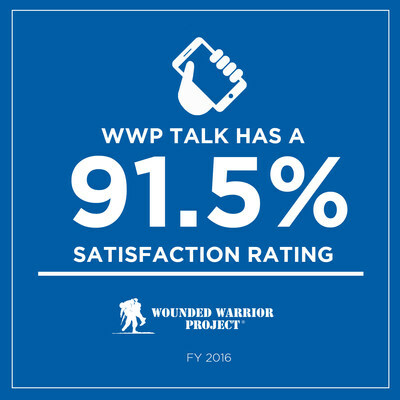 The program has been a lifeline, with 92 percent of participants reporting satisfaction with WWP Talk in 2016 alone. "When warriors lack support and resources needed for recovery and a successful transition into the civilian world, isolation becomes an unhealthy, go-to coping tool, and it can lead to a tragic loss of life," said Ryan Kules, WWP mental health director. "What wounded warriors desperately need is one person to listen and understand how the pain feels for them. This is why WWP Talk is so successful. In a safe environment, warriors have someone they trust listening to their successes and worries – someone who is consistently there to provide that first step in connecting to life and regaining a sense of empowerment." Each week, participants speak with the same helpline support member, developing an ongoing relationship and a safe, non-judgmental outlet to share thoughts, feelings, and experiences. WWP's professionally trained staff help warriors build resilience, develop coping skills, and achieve goals to improve overall quality of health. "The Talk program saved my life," said Angela Peacock, U.S. Army wounded warrior. "It has helped me get to the heart of things – set goals, challenge myself, and find my own solutions. The person who called me was the only person besides my therapist to provide me unconditional support. His calls gave me something to look forward to and to live to for." Through the generous support of donors, the mental health support line is available at no cost to warriors, family members, and caregivers registered with WWP. To register or learn more about WWP Talk, call the Resource Center at 888.WWP.ALUM (997.2586). To learn and see more about how WWP connects, serves, and empowers wounded warriors, visit http://newsroom.woundedwarriorproject.org/, and click on multimedia.